I’ve not felt like blogging or reading blogs lately. Right now, spending more than a hour at the computer gives me a headache. I’ve also been craving stimulation, knit-wise. Instead of the straightforward projects I have lined up, I want to knit something a bit more exciting, and not sock-related. Perhaps a lace shawl? Colorwork mittens? Anyway, today is the last day of June, and I’ve got some finished socks to post! I love, love this colorway. One sock appears to have darker colors than the other. The difference is subtle�I certainly didn’t notice it while knitting or washing or modeling these socks. The zig-zags are mirrored on each sock, a terrific, if subtle, touch. 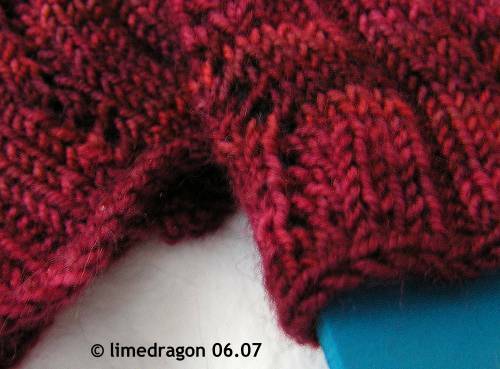 This was a nice pattern to knit, not too complicated, but still requires one’s attention every now and then. I’m not fond of lacy socks, but the amount of lace was just right for me. This 66-stitch pattern is actually a little bit too big in the instep for me. 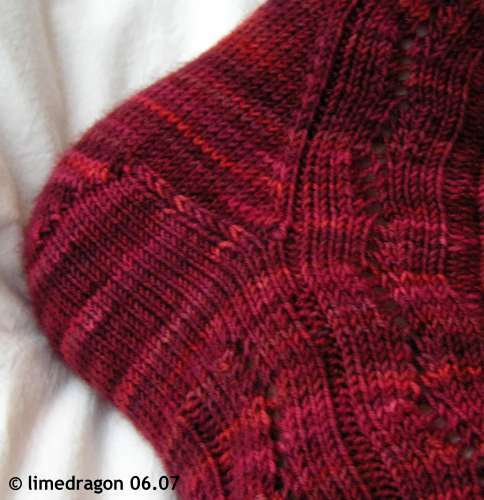 If I knit these socks again for myself (or for someone with narrow feet), I should delete one of the purl stitches in each repeat for better-fitting 60-stitch insteps. I used US 1 (2.25 mm) needles for the foot, and was getting a firm enough fabric that I did not want to go down a smaller needle size. I did go up to a US 1.5 (2.5 mm) after the first half-repeat in the leg section. I also tried for the first time the decrease bind-off as described by Theresa in this Knitty article, but with US 2 (2.75 mm) needles. The result was wonderful; a nice smooth edge that was firm but stretchy at the same time. I was thrilled when I tried on the socks and did not feel any constriction at all at the top. Your socks turned out great! Love the color! Thanks for the heads up on the decrease bind off – I’ve a pair of toe ups on the needles and was considering which way to finish them. The socks look great. Are those new sock blockers? Your socks turned out very well indeed. I’ve not seen that bindoff before. Thanks for the pointer. Sorry to hear about the headaches. Again, those socks are beautiful! The bind-off is neat and the color is marvelous. I really love those socks. That yarn is to die for. Gorgeous! I love the depth of the reds! Gorgeous socks. Love the colour of the yarn too. They look fantastic together. Sorry to hear about the computer induced headaches. Sometimes you’ve just got to take a break. 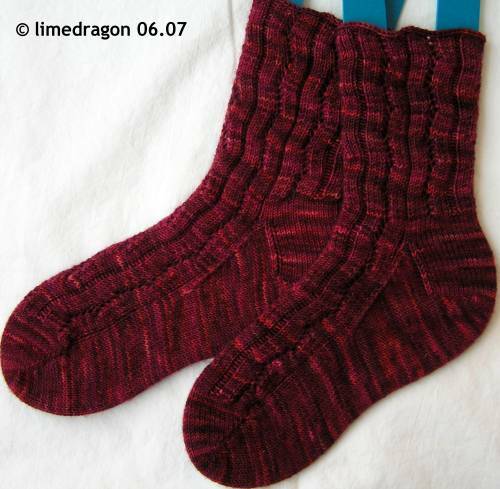 I just got my invite to Sockamania – so I’m going to try to whip this pattern out next week! I love the color you used. Wow they look great! You have been busy. Aha! See you got the same “itch” I got about two weeks ago. Be very careful, it could be expensive and end up with you knitting cobweb weight yarn on size 0 needles. These socks really do look great! I’m half done with the first sock… lol. I love your socks! I have a weakness for those kind of reds, they are just gorgeous, and the pattern looks great! Anni does great designs! Did you come up with a non-sock project?